The prospect of Brexit happening without any deal being reached between the UK and the EU is "unthinkable", Home Secretary Amber Rudd has said. Ms Rudd was responding to a question about the impact on security of nothing being agreed before the UK leaves. "We will make sure there is something between them and us to maintain our security," she assured MPs. Earlier Brexit Secretary David Davis defended keeping the "no deal" option open in the on-going negotiations. After five rounds of Brexit negotiations, the EU has described the talks as in "deadlock" and there has been an increased debate about the possibility of the UK leaving without a deal in place. 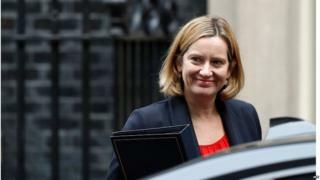 One of the UK's aims is for a new security treaty with the EU, and Ms Rudd told the Commons Home Affairs Committee contingency plans were being made in case this was not in place by the UK's departure in March 2019. Asked whether, if there was "no deal of any form", Britain would be as safe and secure as it currently is, she replied: "I think it is unthinkable there would be no deal. "It is so much in their interests as well as ours - in their communities', families', tourists' interests to have something in place." Ms Rudd also said it was "unthinkable" EU citizens would be asked to leave the UK after Brexit, but was unable to offer guarantees while negotiations continue. Mr Davis was asked about a "no deal" scenario as he updated MPs on Monday's dinner between Theresa May and EU officials. Reaching agreement with the EU is "by far and away the best option" he said, adding: "The maintenance of the option of no deal is for both negotiating reasons and sensible security - any government doing its job properly will do that." International Trade Secretary Liam Fox said there was no reason to fear the impact on the economy of no deal being agreed, saying it "would not be the Armageddon that people project". He told the BBC: "I think that we need to concentrate on the realities, get rid of the hyperbole around the debate and focus on the fact that if we can get a good agreement with the EU, both Britain and the EU would be better off for it." A UK-EU free trade deal cannot be discussed until the EU deems sufficient progress has been made on other matters and gives the green light. In his statement to MPs, Mr Davis said the UK was "reaching the limits of what we can achieve" in Brexit talks without moving on to talk about trade. He urged EU leaders to give counterpart Michel Barnier the green light at this week's EU summit to begin trade talks. Mr Barnier said he wanted to speed up talks but "it takes two to accelerate". This was a reference to comments made by Mrs May after her dinner with the EU's chief negotiator, in which she said the two sides had agreed on the need to "accelerate" the process. Speaking on Tuesday, Mr Barnier said a "constructive dynamic" was needed over the next two months but "there was a lot of work to do" and issues must be tackled in the "right order". "At the moment we are still not yet at the first step which is securing citizen rights, guaranteeing the long term success of the good Friday agreement and finalising the accounts," he said. The talks - which were held as EU member states prepare to assess progress so far on Thursday - were said to be "constructive and friendly" but the UK's financial settlement with the EU continues to be a sticking point and the EU will not discuss trade until this has been settled. Along with the UK's "divorce bill", the EU is insisting agreement be reached on citizens' rights and what happens on the Northern Ireland border before agreeing to open talks on the free trade deal Mrs May's government wants to strike. In his Commons statement, Mr Davis urged the EU to give Mr Barnier a mandate to start discussing its future relations with the UK, including trade and defence, telling MPs he was "ready to move the negotiations on". He suggested the UK was "reaching the limits of what we can achieve without consideration of the future relationship". "Our aim remains to provide as much certainty to business and citizens on both sides. To fully provide that certainty, we must be able to talk about the future." On citizens' rights, he said key issues such as the rules on family reunion, the right to return, the onward movement of British expats in Europe and the right of EU residents to export benefits had still to be settled. Announcing that EU citizens who currently have permanent residence in the UK would not have to go through the full process of re-applying before Brexit, he said the UK had consistently "gone further and provided more certainty" on their status than the EU had done. While the UK had "some way to secure the new partnership with the EU", he was "confident we are on the right path". Speaking in the Commons earlier on Tuesday, Foreign Secretary Boris Johnson said he thought a reported bill of £100bn was too high and urged the EU to "get serious" and agree to settle the citizens' rights question. For Labour, shadow Brexit secretary Sir Keir Starmer said EU and UK citizens were still no wiser over their future while it "appeared the deadlock over the financial settlement is such that the two sides are barely talking". "Nobody should underestimate the seriousness of the situation we find ourselves in. At the first hurdle, the government has failed to hit a very important target."